New Brunswick, N.J. – Rutgers Cancer Institute of New Jersey research stemming from multiple scientific groups further elucidates a tumor suppression mechanism behind the human Parkin gene – which could help inform treatment decisions for breast cancer patients who have a Parkin mutation or loss of Parkin expression. Rutgers Cancer Institute resident research members Zhaohui Feng, MD, PhD and Wenwei Hu, PhD, who are associate professors of radiation oncology at Rutgers Robert Wood Johnson Medical School, are co-corresponding authors of the work published in the November 28, 2017, issue of Nature Communications (doi: 10.1038/s41467-017-01947-w). Drs. Feng and Hu who are also members of the Cancer Institute’s Genomic Instability and Cancer Genetics Program, collaborated with Dr. Eileen White from the Cancer Metabolism and Growth Program, Dr. Bruce Haffty from the Clinical Investigations and Precision Therapeutics Research Program, and Dr. Michael Gatza from the Genomic Instability and Cancer Genetics Program. They share more about the study. A: Mutations in the human Parkin (PARK2) gene have been known to cause a familial form of Parkinson’s disease, a neurodegenerative disease. In addition to its role in preventing Parkinson’s disease, accumulating evidence suggests that Parkin is a tumor suppressor. Frequent Parkin expression downregulation and Parkin gene mutations are observed in various types of cancer, including breast cancer. However, the mechanism of Parkin in tumor suppression is poorly understood, which hinders the development of efficient strategies to treat breast cancer with loss of Parkin function. Metastasis (the spread of cancer) is the major cause of cancer death. Hypoxia-inducible factor 1α (HIF-1α) protein is frequently accumulated in solid tumors, and plays a pivotal role in promoting cancer metastasis. In this study, we investigated the role and mechanism of Parkin in inhibiting HIF-1α accumulation and metastasis in breast cancer to reveal the mechanism underlying the tumor suppression function of Parkin in breast cancer. Q: Describe the research and your findings. A: In this study, we found that Parkin is an E3 ubiquitin ligase for HIF-1α; Parkin directly binds to HIF-1α and degrades HIF-1α through ubiquitination. 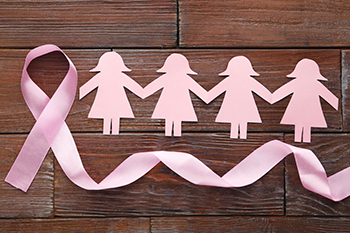 Parkin inhibits breast cancer metastasis through degradation of HIF-1α. Loss of Parkin function in breast cancer cells leads to HIF-1α protein accumulation and promotes breast cancer metastasis, which can be inhibited by targeting HIF-1α with RNA interference or the small-molecule HIF-1α inhibitor YC-1. In clinical human breast cancer samples, low Parkin expression is significantly associated with high HIF-1α expression and the poor distant metastasis-free survival in human breast cancer. Our results demonstrate that Parkin plays an important role in suppression of breast cancer metastasis, and furthermore, reveal that negative regulation of HIF-1α is an important mechanism whereby Parkin inhibits breast cancer metastasis. Q: What are the implications for future treatments? A: These results reveal that negative regulation of HIF-1α by Parkin is an unidentified and critical mechanism for Parkin in tumor suppression, and loss of Parkin function constitutes an important mechanism contributing to HIF-1α accumulation and breast cancer metastasis. These results suggest that targeting HIF-1α could be a feasible therapeutic strategy for breast cancer with Parkin downregulation. Along with Drs. Hu and Feng, the other authors on the research are Juan Liu, Cen Zhang, Yuhan Zhao, Xuetian Yue, and Hao Wu, Rutgers Cancer Institute and Rutgers Robert Wood Johnson Medical School; Shan Huang, Rutgers Cancer Institute, Rutgers Robert Wood Johnson Medical School and Wenzhou Medical University, China; James Chen and Kyle Tomsky, Rutgers Cancer Institute and Rutgers Robert Wood Johnson Medical School; Haiyang Xie, Zhejiang University School of Medicine, China; Christen A. Khella and Michael L. Gatza, Rutgers Cancer Institute and Rutgers Robert Wood Johnson Medical School; Fajing Xia, Zhejiang University School of Medicine, China; Jimin Gao, Wenzhou Medical University, China; and Eileen White and Bruce G. Haffty, Rutgers Cancer Institute and Rutgers Robert Wood Johnson Medical School. This study was supported by the National Institutes of Health (NIH) (R01CA143204), Rutgers Cancer Institute of New Jersey Pilot Award, New Jersey Health Foundation and Bush Medical Research Award (to Z. F.); NIH funding (R01CA160558, R01CA203965), Department of Defense (W81XWH-16-1-0358) and Ellison Medical Foundation funding (to W. H.); and a grant from the Breast Cancer Research Foundation (to B. H.).